If you don’t live around here, you may not be familiar with the process shown in the video above. The leaves are imported from China, or someplace, and the wind does most of the work. The colors are nice. I shot the video on Monday at our Enemy Club No. 2, where I played with Hacker (real name) and Paul. 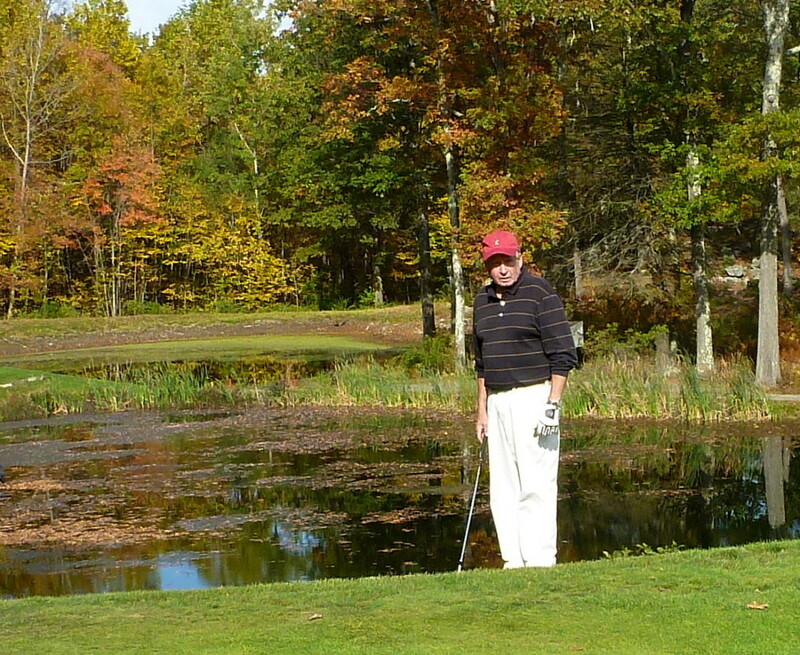 We have a big team match coming up there in early November, and Hacker and I were studying the greens. Paul joined us because he had nothing better to do. We played 10-Ball with a Snake add-on. Hacker, seventh hole, Enemy Club No. 2. The course is my second favorite nine-holer in our part of the state—after our home course, naturally. It was built on the former estate of some rich guy, and it has lots of old apple trees, which are left to look after themselves. 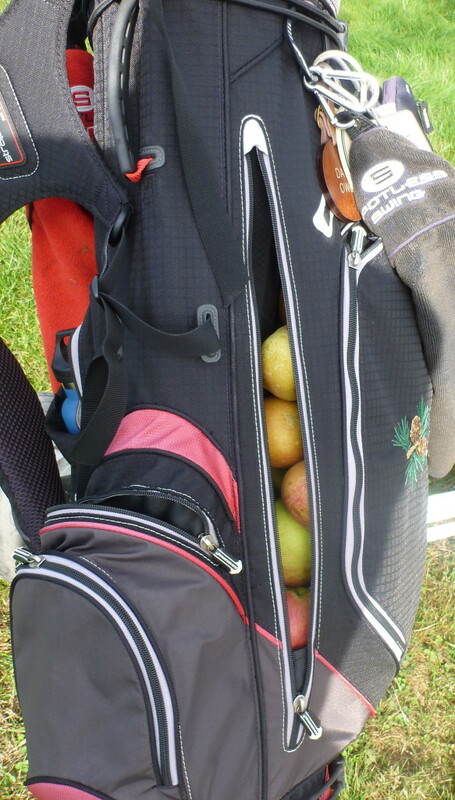 Whenever I play there in the fall, I cram apples into my golf bag. They taste a million times better than any of the apples in a grocery store. 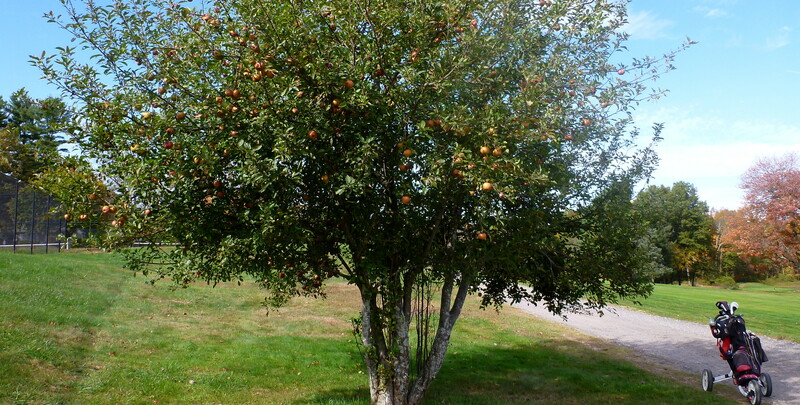 In fact, I hate apples, except for these. I had a little trouble zipping this back up. 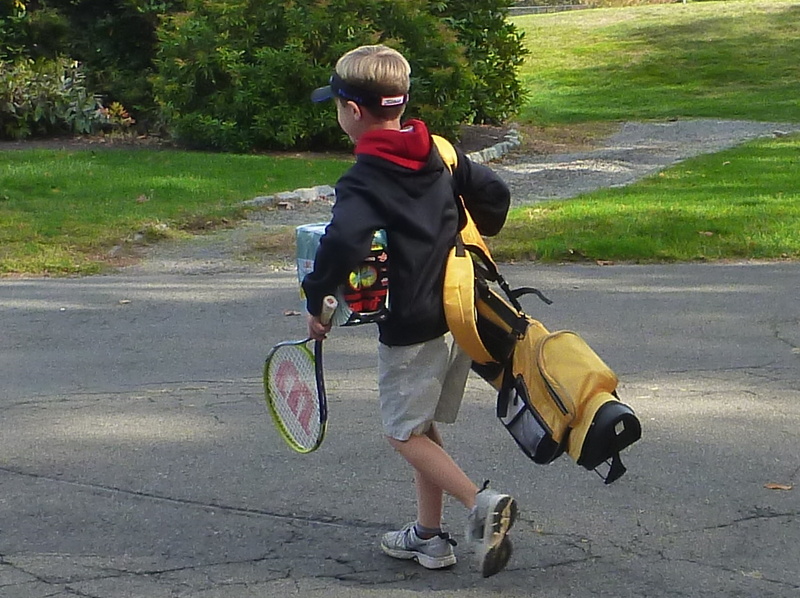 There were very few other people on the course—a surprise, given how nice the day was. 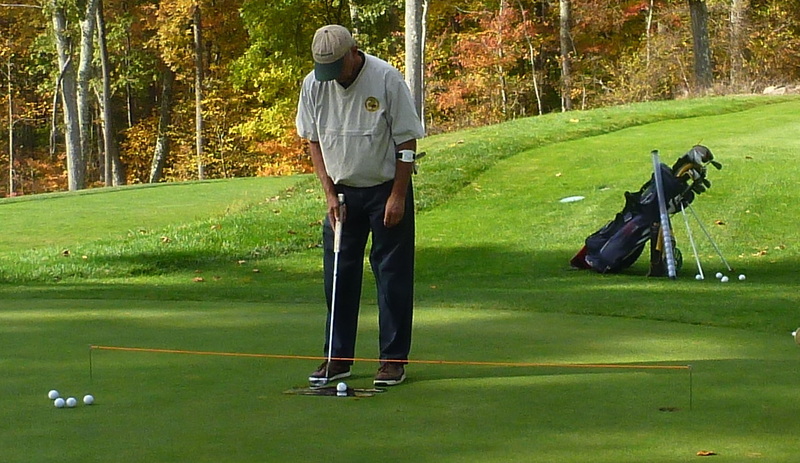 We saw a guy on the practice green who said he was trying to become a less crappy putter. I think the thing on his left arm may be a practice gadget, too. And we saw a kid who, apparently, had invented a game that’s even more complicated than the stuff that Hacker and Tim come up with. This entry was posted in Enemy Club, Games, Hacker (real name), Sunday Morning Group, Weather by David Owen. Bookmark the permalink. I think you’re right about the arm thing. I gave myself the beginnings of tennis elbow by repeatedly scooping up my golf ball with the back of my putter. I now have a new putter (which I’ll write about tomorrow), and because it can’t grab a golf ball my elbow feels much better.